I am probably the least 'zen' person in the entire world. I don't do yoga, my mind rarely switches off and when I should be in bed sleeping I'm usually wide awake contemplating ridiculous thoughts. At a time when 'mindfulness' seems to be a big trend I disappointingly don't seem to fit the bill. So when I was offered to try out a flotation experience, which is said to help you totally relax, at the new Floatworks centre in Vauxhall, I thought maybe this was the key to finally helping me switch off! 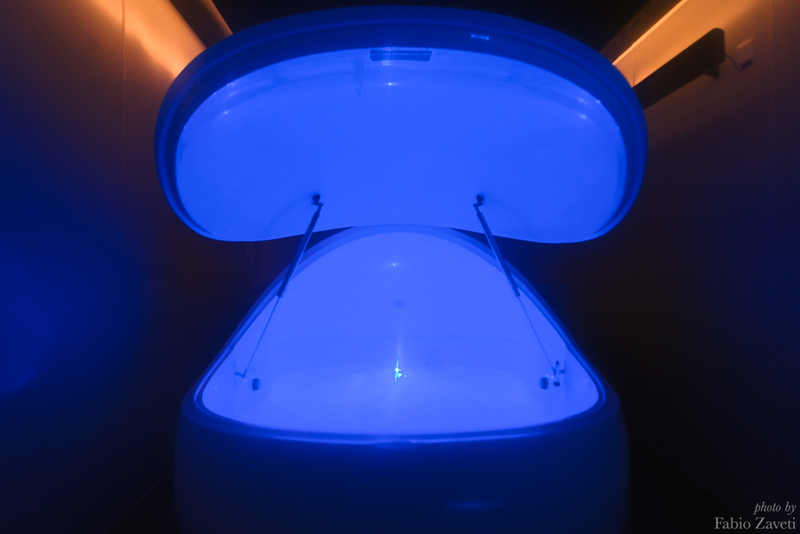 Flotation involves floating in a tank half filled with Epsom salt water, to reach a state of total relaxation. 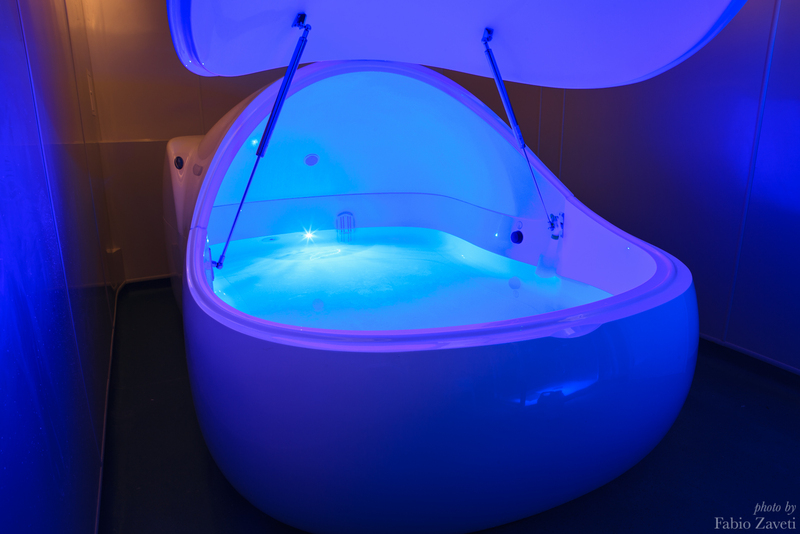 The water is set to body temperature and the room is dark and silent, helping you to switch off. Once I arrived and read through all the basic information I dropped off my bag and coat in a locker and was given a pair of flip flops to wear before being taken to my own personal floating room. Inside was a large shower and my flotation tank, which looked like a giant pod. The woman at Floatworks was extremely excited for me as I was trying flotation for the first time and thoroughly explained that I was to take a quick shower, dry my face off thoroughly (as the salt water might itch) use the petroleum jelly provided to cover up any cuts or grazes on my body, then pop the earplugs in and get into the float tank! I was advised to close the lid on the float tank but the thought of doing that terrified me so I left it open! 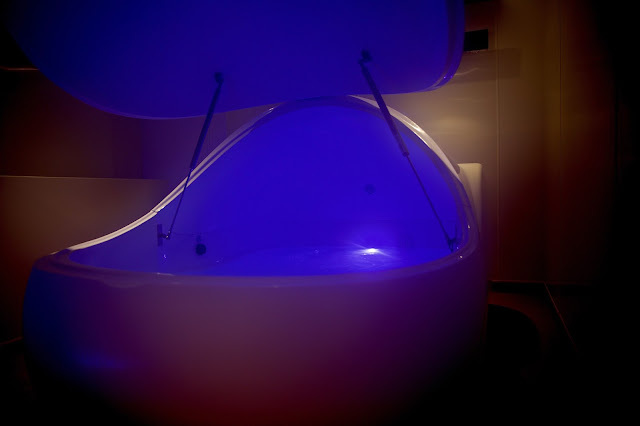 Stepping into the tank and lying back it was easy to get used to the sensation of floating and I was comfortable just relaxing my body and letting the water take my weight. After a few minutes the lights in the room completely dimmed, just leaving the blue lights in the tank on - there is a button you can press to switch off the lights leaving you entirely in pitch darkness but again I was too scared. So, once I was floating I thought 'What now?' and kept going over different questions in my head - should I leave the lights on or off? How long do I lie here for? What if I go over my time and don't realise? - but after a while I eventually managed to relax. With my eyes shut tight it felt like I was slowly moving along the water and I was convinced I was going to hit the end of the tank at any moment, but when I opened my eyes I realised I actually wasn't moving at all. Allowing yourself to let your body go in the water is a great feeling! But my state of relaxation didn't last long (like I said, I'm not very zen..) and after a while I started to feel a bit chilly (perhaps I should have closed the lid on the pod after all!) so I started moving around in the water to warm up. You know when it's time to get out the pod as the lights slowly come up and music starts to play. Then you need to take a thorough shower to get the salt off your body and hair. Floatworks provides toiletries and the showers are super powerful so this isn't an issue! Stepping out the pod my body suddenly felt heavy again and I realised just how weightless I felt in the water. I felt very calm and refreshed and the stresses of my day at work had completely disappeared. Upstairs Floatworks provides hairdryers and straightners and there is a separae chill out zone where you can sit with a warming cup of tea and chat to other floaters about your experience. So while I didn't completely switch off during my visit to Floatworks I think this session was very much about me getting used to the experience, so I'd love to try it again! It was a completely unique way to spend my afternoon and an experience I would recommend to help with relaxation and to aid sleep. Take a look at the Floatworks website here!